A puppy eats a lot of food. From birth up to six months of age, he’ll need to eat two to four times as much as an adult dog to support all that growth. A good rule of thumb (paw?) is that after his first week of life, when his weight doubles from what it was at birth, a puppy should gain one to two grams per pound of anticipated adult weight each day. This means that if your German Shepherd puppy weighs 75 pounds as an adult, he should gain three to five ounces per day as a puppy. Generally speaking, puppy food is higher in protein and enriched with vitamins, minerals, and fats essential for growth–that is, when compared to dog food made by the same manufacturer. Still, ingredients across brands can vary greatly. Commercial puppy food must meet AAFCO (Association of American Feed Control Officials) nutrient standards for growth, and many companies go above and beyond those standards, testing their products to make sure they support puppies’ development. They don’t have to, though–they’re only required to meet the minimum nutrient standards. In most cases, you get what you pay for. Lower-quality ingredients are found in the cheaper brands while “premium” and “performance” varieties include higher quality ingredients for improved digestibility. Buy “puppy food.” It’s more likely to have the extra nutrients a puppy needs until he’s full grown. (Ask your vet for guidelines on when that might be–small dogs of course mature more quickly than big dogs.) Regular food labeled “for all life stages” is fine too. Consider breed-formulated food. Large-breed puppy formulas help bigger pups grow at a rate gradual enough that they have time to develop strong bones and joints. Small-breed formulas provide concentrated nutrition in small, bite-size kibbles that meet a smaller puppy’s high metabolic needs. And, yes, medium-breed formulas aim somewhere in between. If you can’t find breed-formulated food, that’s okay. 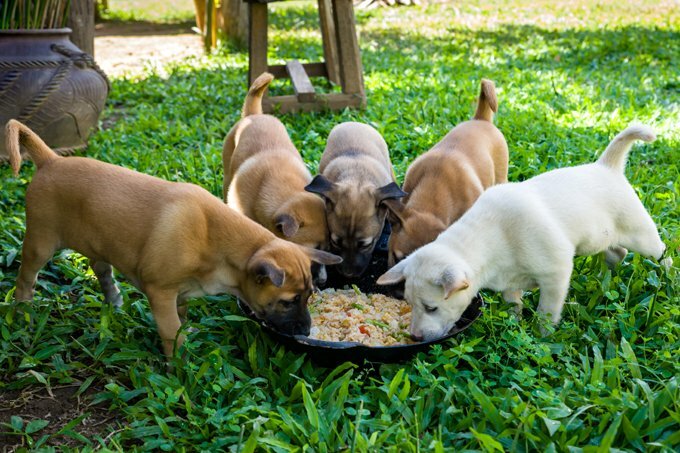 Puppies need to eat a lot–and not too much. You should be able to feel but not see their ribs, and they should have a visible waist when you look down at them. This is true for puppies of any breed, big or small. In general, you should follow the guidelines on the back of the bag of dog food, and adjust up or down depending on your puppy’s appetite and body condition. At around eight to 12 weeks of age your puppy is probably eating three to four times a day. He doesn’t have to eat that many times though. If it suits your schedule to feed him only twice a day, just divide the amount of food you’d normally give into two meals instead of three or four. After he’s six months old you can–and should–reduce the number of meals you feed him to two. Start reducing the amount of food he gets as well, following guidelines provided by food manufacturers, adjusting as needed. If you’re feeding too much, most dogs will let you know by leaving some behind in his bowl. Large-breed puppies need slow, sustained growth to help prevent orthopedic problems, such as hip dysplasia. Raise them on a diet designed for large-breed dogs or food for adult dogs. Whatever diet you choose shouldn’t overemphasize protein, fat, and calorie levels. Small but chunky breeds, such as pugs, also need a lower-calorie diet than what’s provided by most puppy foods, because they’re also prone to hip dysplasia. Feed your dog at set times each day rather than leaving food out all the time so he learns a schedule. The exceptions are tiny breeds such as Chihuahuas, who can be prone to hypoglycemia (low blood sugar). They should always have food available to nibble on. Never feed your puppy from the table. It only encourages begging. Everyone in the family must follow this rule.